Mitsubishi was forced to try and update an airframe that was running out of "stretch." The A6M5 Model 52 appeared in mid-1943. The wingspan had been reduced by 1 meter, as had the A6M3 Model 32, though the wingtips were rounded rather than "clipped." A complete redesign of the cowling resulted in the installation of single thrust-type exhausts, which with the uprated Sakae engine increased speed from the A6M2 Model 21's 335 m.p.h. to 358 m.p.h., a useful increase but still not as fast as the new fighters it opposed. The armament was changed from the Type 99-1 drum-fed 20mm cannon to the Type 99-2 belt-fed weapon. This aircraft, the A6M5a, would continue as the main Japanese Navy fighter until the end of the war. Hasegawa can now lay claim to the Mitsubishi Zero in the way that they "own" the Messerschmitt Bf-109. With this kit, a modeler can now do every major type of Zero flown during the war. A quick look in the box reveals that this is definitely not a lightly once-over update of the A6M5 Zero released by Hasegawa in 1981. That kit, one of the first real upgrades of a plastic kit in terms of detail provided and engineering for ease of construction and accuracy, is now showing its age, with its raised panel lines. While it can still be built up into a more than acceptable model, this new release eclipses it completely. This is the best Zero kit Hasegawa has put on the market to date. With nice engraved detail, and the standard Hasegawa crisp molding, the kit also provides something no other Zero kit from any manufacturer has done: the flaps are down. 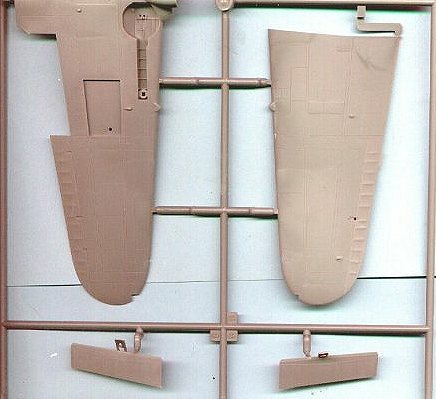 Editors note: rather than show all the sprues, most of which are common with other Zeros, the most important change; that of the wings and flaps has been shown to the right. There are underwing inserts depending on which version is being kitted. 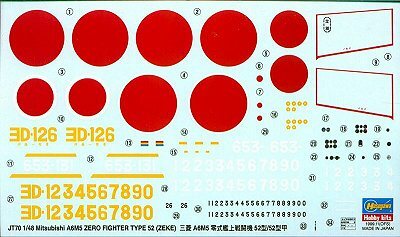 Decals are provided for an aircraft of the 653rd Flying Group aboard "Zuiho" at the time of the Battle of Leyte Gulf in October 1944, and a Zero flown by Ensign Akamatsu Sadaaki of the 302nd Flying Corps at Yokosuka in 1944-45. Anyone who has read the description of Akamatsu in Saburo Sakai's "Samurai" knows this is one Japanese ace who completely did not fit the mold of a Japanese Navy pilot. Prewar trained, he was repeatedly broken in rank due to his off-base behavior, his lack of respect for superiors, and his thoroughly-unJapanese individualism. Only his superlative skill as a pilot at a time when Japan had fewer and fewer pilots of his ability kept him from being cashiered. Sakai describes Akamatsu as a man who spent all his off-base time in the nearest geisha house, drinking sake and carousing like an outlaw. He would delay his takeoff to the last moment, driving wildly onto the base still waving a bottle of sake as he climbed out and boarded his airplane for takeoff. In the air, he was a demon, one of the highest-scoring IJN aces. He was one of the few pilots to also become an ace in the J2M "Jack," and specialized in going after P-51s in that airplane; when one considers that he shot down over ten P-51s and five B-29s in an airplane that was supposed to be "meat on the table" to the Mustang, you get an idea of his accomplishment. He survived the battles over the homeland and became a restaurateur after the war. Overall, this is an excellent kit that will likely move toward the top of the to-do list fairly quickly. Thanks to MarcoPolo Imports for providing the review kit.